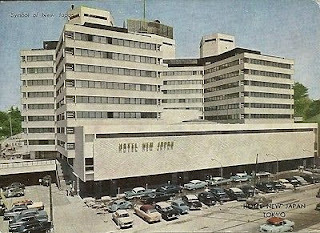 The Hotel New Japan is famous for a fire that consumed the top two floors of the ten story building on 8 February, 1982. The hotel, located in Akasaka, sandwiched between the fringes of the business and nightlife districts of Tokyo, was opened in the early 1960's in preparation for the Olympics of 1964. Thirty three people lost their lives in the fire that morning and as many more were injured. But the reason why The Hotel New Japan became infamous was more to do with what came next than actually the fire itself. The General Manager refused to apologise for the tragedy in accordance with traditional and accepted etiquette and, as a result, the hotel attracted pariah status, remaining a burnt out shell for the best part of the next two decades, untouched by any would be developer. Not bad for prime real-estate in central Tokyo. But all this is well known and documented and merely the epilogue of an older story that occurred some twenty years earlier. Curiously less well known than the fire and its subsequent troubles is the fate of Rikidozan, Japan's first superstar pro-wrestler, ex-sumo rikishi, entrepreneur, man of vast wealth and, more than anything else, an outstanding bon-viveur of colossal proportions. 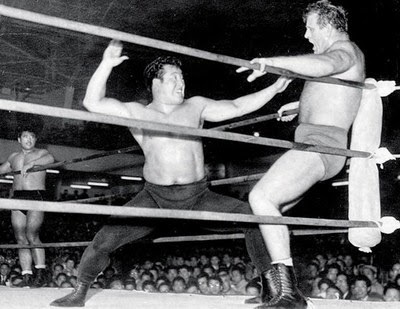 Rikidozan had sniffed the way the wind was blowing for sumo in the 1940's and in 1950 decided to get out of the game. 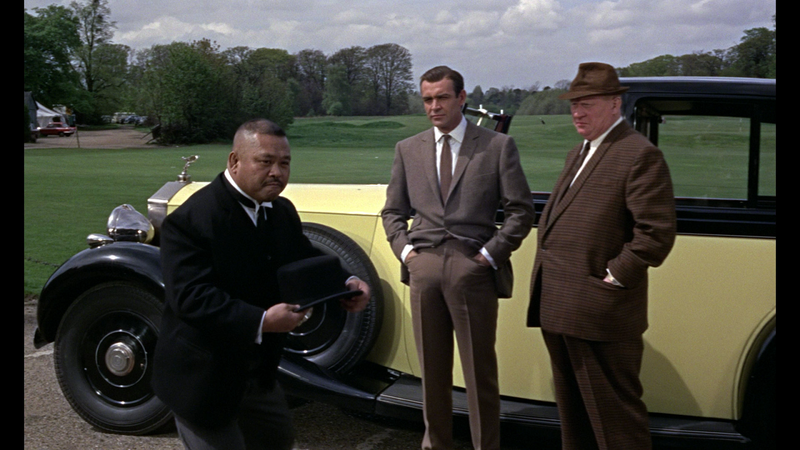 A chance encounter with an American pro-wrestler by the name of Harold Sakata (later to be more widely adored as the bowler hat wielding butler, Oddjob in the Bond movie Goldfinger), convinced Rikidozan to try his hand at the sport. In a series of carefully choreographed, pre-arranged fights, Rikidozan, single-handedly beat the American Champions and brought a staggering dose of pride back to the country, still smarting from the war and subsequent US occupation. With his signature karate chop, he beat all comers, one after another; and the fans went wild. So popular did Rikidozan become that he is said to have single-handedly launched the market for television in Japan, a few hundred thousand sets one year exploding into several million the next, so the country could wildly cheer him on, beating the barbarians to a pulp. And he, like many others of the time, enjoyed spending his evenings in the latest place to be, a club called the New Latin Quarter, nestled in the basement of the aforementioned Hotel New Japan. And there, on the 8th December 1963, the hero of Japan's recovery became embroiled in an argument with a relatively young member of the local Yakuza gang who settled the discussion with a knife he carried in his belt. A week later, Rikidozan, the warrior hero of a newly energised populace, succumbed to his injuries and hung up his champion's belt one last time, shuffling off this mortal coil to a corner in the great pro-wrestling ring in the sky. He had lifted the country and restored the pride of a nation whilst all the time keeping one great secret. Rikidozan wasn't Japanese, he was Korean.